One way to build wealth is by accumulating shares of common stock. Shares of individual stocks and baskets of stocks are available at brokerage firms. In addition, some companies allow (or even encourage) their employees to acquire company stock or employer stock through various employee benefit programs. Employers may sell shares of company stock at discounted prices through an employee stock purchase plan (ESPP). They may offer stock options, allowing employees to purchase shares at a certain (favorable) price sometime in the future. They may include company stock as an investment choice in the 401(k) plan. They might give stock to employees through an employee stock ownership program (ESOP), which may also be part of a retirement benefit or profit-sharing plan. Accumulating company stock has been a good way for my family to build wealth. I've heard others say they've been able to generate income by buying shares at a discounted price and then selling shares at the market price (when the market is higher). In this way, they may have more money available to pay off debt or invest, increasing their net worth. We've sold shares of company stock in order to make the maximum level of Roth 401(k) contributions. My husband's employer recently introduced the Roth account within the 401(k) plan. As a result, he can now make Roth contributions and boost Roth account balances by $24,000 each year ($18,000 maximum plus $6,000 in catch-up contributions because he's over 50). Neither of us have been able to accumulate a large balance in a Roth IRA. This type of IRA was introduced more than 15 years after we started saving for retirement. So, we couldn't have funded a Roth IRA when we were in our 20s. Later, I considered a Roth conversion. This process involves moving money from a traditional IRA to a Roth IRA. But I wasn't interested in generating a tax bill on the conversion. In addition, the income limitation with the Roth IRA sometimes made us ineligible to make contributions. Typically, our income wouldn't exceed this threshold. But if we sold shares to fund the account, we may have boosted our income to a level that disqualified us from making a Roth IRA contribution. Fortunately, the Roth 401(k) account doesn't have these income eligibility guidelines. (There are advantages to both traditional and Roth accounts; I wanted to build a retirement-account balance that I could tap without tax consequences). By selling company stock to ensure we'll have the cash flow to make Roth 401(k) contributions, we'll pay more taxes now compared to what we might pay with a similar level of contributions to a traditional 401(k). However, by maxing out contributions, we supercharge our Roth account balances. At the same time, we snag the full company match, increase retirement holdings, and diversify our investment portfolio. We've sold shares and given the proceeds to a charitable organization. With this approach, we pay taxes on the gain in the shares' value. Then, we claim a tax deduction in the dollar amount of the gift when we file our income taxes. However, there's a better approach tax-wise, which we've also done. We've transferred shares to a designated charity. In this way, we receive a tax deduction on the value of the shares but avoid capital gains taxes. The charity can then sell the shares to generate cash. There's a fee for the service, a minimum of $100 per year. But I like separating the timing of my tax-deductible contribution from my schedule for charitable giving. I'm also happy to have accurate records of my giving. We've sold some company stock to pay for our sons' college expenses. I started saving for college expenses when my kids were babies. At that time, our choices for college-savings accounts were limited to UTMAs/UGMAs (general accounts benefiting children) and Coverdell ESAs (educational savings accounts). With Coverdells, we could choose among the many investment options available through a brokerage account and control investing costs. However, we could contribute just $2,000 annually. By the time 529 plans became a viable choice (with broad investment options and low costs), my savings excitement had waned and I focused on other goals. In addition, I underestimated the cost of college and overestimated investment growth. So when college expenses arrived, I periodically sold investments to pay these bills. We also applied current income to cover our shortfall. This approach has its drawbacks: the sale of company stock increases our taxable income. Higher taxable income can mean fewer opportunities for financial aid. It lessens our children's attractiveness for scholarships with a need-based component. And, it can reduce eligibility for certain college-related tax credits. In hindsight, building a substantial balance in 529 accounts by selling company stock when my kids were in middle school or high school may have been a better approach. But, an advantage of selling shares to pay specific expenses is that we won't have to concern ourselves with an excess amount in 529 accounts. In addition, we've avoided borrowing money for college expenses. Similar to funding college expenses, we've tapped company stock to pay for large purchases. For example, I've sold investments to cover costs associated with a major kitchen renovation and the replacement of an air conditioning system. This process has led to diversification. We've moved equity investments to real estate investments. It's increased the value of our home (in some cases) and enabled us to handle major repairs and renovations without taking out a home equity line of credit. On a regular basis, I've sold shares and transferred cash proceeds into a savings account. In general, I prefer to hold stocks over cash. Stocks hold the possibility of growth while cash has the potential to lose value due to inflation. But lately, I've begun to appreciate the need for cash. Money in savings is worthwhile. It supplements our emergency fund. It allows us to avoid selling shares when the market is down — in order to pay for major purchases. In addition, a savings account provides a cash reserve for stock purchases at opportune times. By using company stock to grow my cash on hand, we'll miss the opportunity for continued increase in the value of these shares. But we may also avoid drops in share value due to economic uncertainties. Most importantly, we'll achieve a more balanced portfolio. Buy bonds and other stocks. I've sold shares of company stock in order to diversify my investment portfolio. In the beginning, I was more hesitant to sell as I wasn't always sure what investments I wanted to buy. As I've progressed, I've been more intentional about developing and implementing an investment strategy. Proceeds from the sale of shares in company stock have been redeployed to purchasing shares of bond funds and other stocks. By selling a set amount every year, I can control taxes on capital gains. At the same time, I can diversify my investment holdings and create a portfolio that I hope will generate income for many years to come. Holding onto company stock is often frowned upon by financial advisers. Many advisers are genuinely concerned that wealth will evaporate on a sudden decline in share prices. This scenario may be more likely if the shares are currently overvalued or recently grew substantially in price. At least one adviser has wanted me to sell shares so he can manage assets for me (see my article on the dark side of assets under management). Despite risks associated with this course of action (or inaction), I've held some shares. I haven't clung to company stock stubbornly. Stock splits and growth in the value of my holdings haven't outpaced spending and steady efforts to diversify. Much of the advice relating to company stock or employer stock that I've encountered has centered on selling as quickly as possible. This approach didn't resonate with me. Over the years, I've learned ways to use shares to avoid debt, diversify our portfolio, grow our net worth, and hopefully benefit the community through charitable giving. 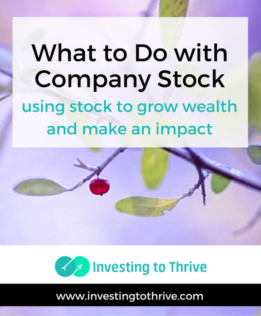 How have you used company stock to achieve your goals?